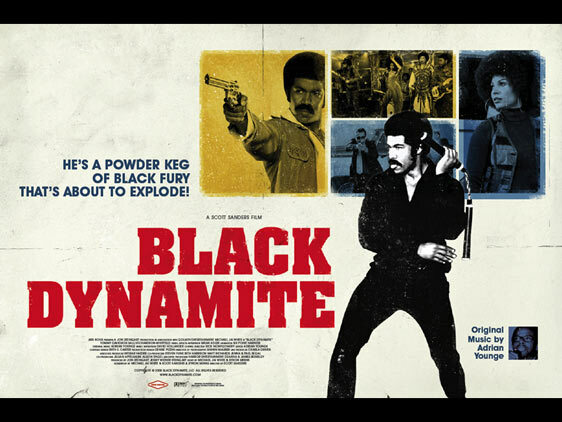 BLACK DYNAMITE: The Mack Of Blaxploitation Parodies Cleans Up The Comedy Ghetto – Schlockmania! Blaxploitation was ripe for satire from the get-go but few have been able to get the job done. I’m Gonna Git You Sucka has its devotees but Your Humble Reviewer has always found it to be a slapdash piece of work that leans on t.v.-level schtick instead of genuine, genre-appropriate satire. The same could be said for Pootie Tang. Even Undercover Brother, a consistent and genuinely funny film, is more a satire of spy movies than a true blaxploitation sendup. Thankfully, the wait is over. 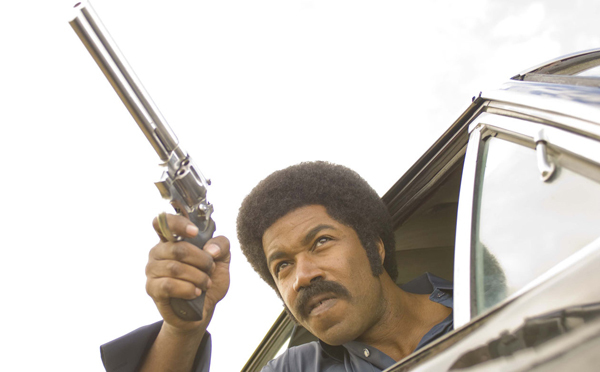 Black Dynamite is the real-deal blaxploitation satire that genre fans have been waiting for. Michael Jai White plays the title character, a streetwise enforcer who arms up for revenge when his brother is killed while trying to infiltrate a drug ring. 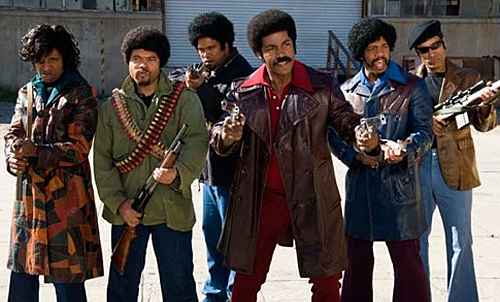 Black Dynamite soon enlists pal Bullhorn (Byron Minns) and some other neighborhood cats in the fight when they realize said drug syndicate is pushing heroin to orphans(!). As the superbad hero fights his way up the syndicate’s roster, he uncovers a bizarre conspiracy – and the shocking secret identity of the man who runs the drug syndicate. The key to the appeal of Black Dynamite is that it does its satirizing in context – instead of trying for nostalgia from a modern vantage point, all elements of the film are designed to make it look and feel a genuine blaxploitation entry from the early 1970’s. Shaun Maurer’s cinematography captures that earthy, grainy look of a low-budgeter from the era and the soundtrack mixes genuine 1970’s music-library stuff with spot-on approximations by Adrian Younge. Younge’s work also includes some hilarious songs where the lyrics describe what is happening on the screen as it unfolds. Scott Sanders’ direction weaves all the retro touches into a convincing period filmmaking feel. He goes for an approach that is 80% deadpan approximation and 20% breaking the fourth wall. There are occasional ill-timed camera moves, continuity errors and wonky action choreography but he doesn’t overdo them. Such moments are included to create the feel of a quickly-made cheapie instead of endlessly leaned on as cheap gags. He also maintains a tight, energetic pace that keeps the gags flowing at a Zucker-Abrahams-Zucker speed. The result is fast and funny enough that it can be enjoyed by those who aren’t blaxploitation fanatics. Best of all, the script for Black Dynamite provides a firm basis for all the rapid-fire comedic riffing. The story, devised by stars White and Minns with director Sanders, shows the trio did their blaxploitation homework: scenes, plot devices and characters explicitly reference films like Slaughter’s Big Rip-Off, Three The Hard Way and Dolemite but the many reference points are woven into a nicely composited homage. More importantly, all the gags are structured around a tight, involved plotline that is as engaging and outlandish as the jokes themselves. In fact, the plot developments are often funny on their own: a great example is a hilarious scene where Black Dynamite and his friends figure out the conspiracy using the most absurd clues and logic imaginable. Finally, and most importantly, the performances drive the material home. All the main actors keep the schtick consistent with their characterizations and in some cases do loving tributes to blaxploitation icons: for instance, Tommy Davidson’s performance as a dandified pimp called Cream Corn is a loving send-up of Antonio Fargas and Byron Minns does a pretty amusing Rudy Ray Moore impression as Bullhorn. There’s also some nice support in cameos from genuine actors like Mykelti Williamson and Bokeem Woodbine, each providing solid, non-flashy performances for the comedians to bounce off of. However, the movie’s biggest and best attribute is Michael Jai White’s performance as the title character. It is both pastiche and legitimate action-star turn all at once. In his performance, he has managed to fuse the detached delivery of Jim Brown, the effortless cool of Bernie Casey and the dexterous, showy yet odd-looking kung fu of Jim Kelly into a seamless whole. He nails every gag and witty line with deadpan skill and performs admirably in the action scenes (White is actually a real-life martial arts pro). He’s hilarious without resorting to mugging or obvious schtick and he shows a real star quality despite the performance’s parody angle. 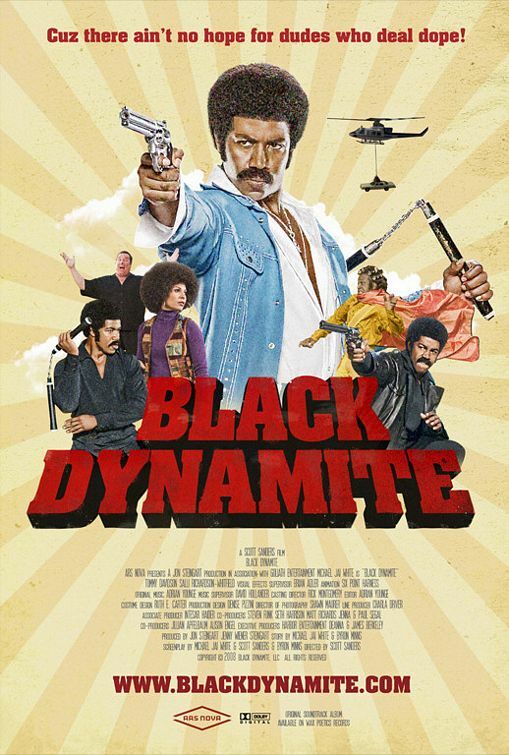 To sum up, Black Dynamite is the smart, lovingly-crafted parody blaxploitation fans have been watiing. It will slot in nicely on the DVD shelf alongside your Fred Williamson, Pam Grier and Rudy Ray Moore flicks. What you waitin’ for, you jive mutha? Previous ArticleSchlock-Wire: Expanded, Limited Edition Reissue of EMANUELLE IN AMERICA Soundtrack Now Available From Beat Records! I saw the movie a couple of days ago with friends, and it had all three of us crying from laughing so hard. With the tired “___ Movie” franchise of the last five years, I wondered would anyone EVER make a competent parody/satire movie. This movie answered that question, as it was brilliantly done! Great review. Thanks for the kind words, Brandon. And I agree with you – BLACK DYNAMITE shows good satire is still possible. It just takes focus, work and inspiration. This movie was hot!.. Damn was this movie hot!. I went to the the-a-ter CAUSE I CRAVED SATISFACTION! Rudy Ray Moore would be proud. I really think they should do a part 2 of this one. Too bad it didn’t get the love it deserved. Damn. Amen, bro. Considering all the awful comedies that Hollywood puts out each year, it’s depressing to see something this good couldn’t get a wide release. I’d love to see him doing more mainstream work: he was really fantastic in BLOOD AND BONE, too.